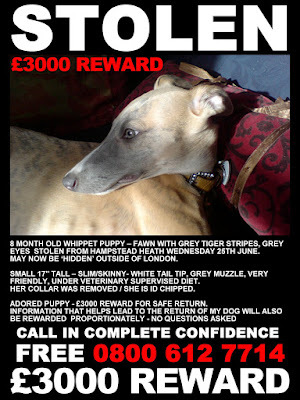 I mentioned this story a few days ago, but it seems that Manon the Whippet has still not been found. In desperation her owners have contacted Dogs Trust, asking us to spread the word about their beloved pup. Although they live in the Hampstead Heath area, it is possible Manon was stolen and is being 'hidden' outside London, so keep your eyes peeled wherever you are. Local residents Ricky Gervais and Jonathan Ross are also involved with the search, both taking to the streets to look around and donating towards the reward fund. If you have a blog or website and you can post the image above, please do so. A lost pet causes a great deal of worry and distress to any family, and we all sincerely hope Manon - who is microchipped - can be located soon. If you have any information at all, please don't hesitate to call and help put some dedicated dog owners out of their misery.